America’s antiques experts take you shopping at everyday and extra-special flea markets—you’ll see WHY collecting is fun and profitable and learn the WHEREs, WHENs and HOWs of buying and selling. Watch the HGTV video series, “Flea Market Finds with the Kovels,” the TV show that will make you an expert on almost anything you see at a flea market. DVD sets of Seasons 1, 2, 3 and 4 (12 episodes each). 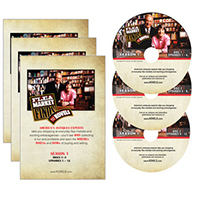 Plus get a FREE DVD with bonus episodes from seasons 1-4 with your order!